Duane Allman's goldtop Les Paul. the Layla sessions are finished, except for the coda to the title track (done three weeks later), and the Allman Brothers are playing a show in Daytona. The opening band is called Stone Balloon. Rick Stein of Stone Balloon has a "plain- top" 1959 sunburst Les Paul, which Duane admired. They work out a trade, with Duane giving them his 1957 goldtop Les Paul (serial number 7-3312), along with $200.00 and a Marshall head, for their '59 sunburst. As part of the trade, Duane keeps the pickups from the goldtop, putting them in the 'burst, and the original pickups from the 'burst are installed in the goldtop. ... fast forward to a music store in Daytona, early 1977. Randy Roberts buys the Goldtop from Rob Anderson, then puts it on consignment at Coastal Music to Jim Omby, who ends up with a 1957 Les Paul, serial number 7-3312, with a stripped and refinished top. Billy Bowers, a great player from Jacksonville, comes in, recognizes the guitar, and alerts his friends Peter Young and Scot Lamar. Jim mentions that the guitar once belonged to Duane Allman, but it's not a big selling point. Scot buys the guitar, paying about what Les Pauls were worth at that time. ... 20-odd years pass. This is where my part of the story sort of begins. By this time I'd been dealing in vintage guitars for about twenty years or so myself. the tone of Duane Allman's slide sound, and the guitar he used. My old friends Scot and Pete mention to me that they have Duane Allman's goldtop. I get on a plane and fly to Arizona to see, photograph, hold, and document the guitar. This IS the guitar Duane used on everything from Statesboro Blues to Layla! record with it if I ever want to. Since then, the goldtop has been expertly refinished by Tom Murphy, the genius behind the Gibson Historic series, and arguably the best "goldtop guy" in the world. including where a previous owner's puppy had chewed the headstock! telltale inlay on the 15th fret from these early photos. 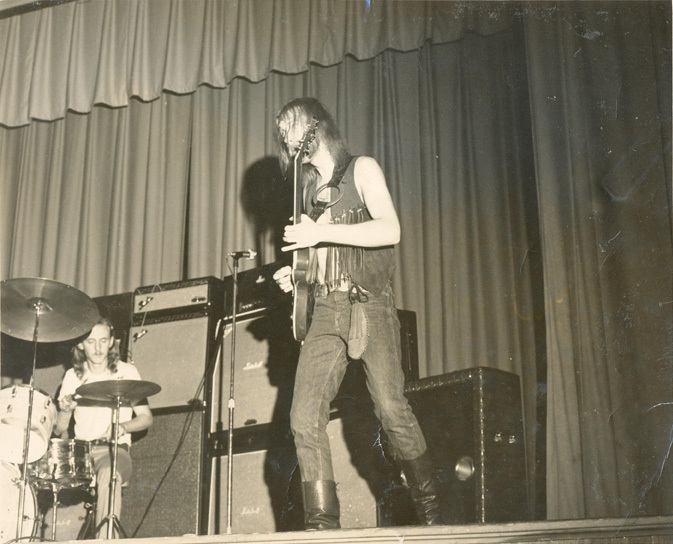 So, that is the story of Duane Allman's goldtop up to now. The guitar is now for sale, only to a good home, or anybody with the right offer! I've verified every document shown on this site, from the testimonials of the store owner in Daytona and the members of Stone Balloon, to Bobby Whitlock's heartfelt testimonial to the guitar and to Duane (who taught Bobby how to play slide on this guitar). Tom Dowd documentary "The Language of Music". Before I became keeper of the Gold Flame, Pete got in touch with Dickey Betts and Tom Dowd, who verified the serial number was correct. There is only ONE goldtop that Duane Allman played for most of his career, that was his favorite, and now it could be YOURS!! 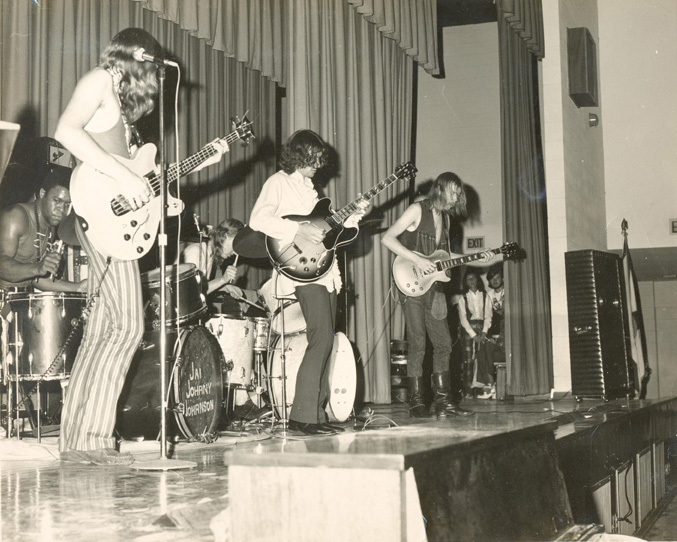 for me, it was in a Battle of the Bands at Gainesville High School in 1969.
but I never really understood until much later just how life changing it all really was. and by then realized that "something was up". has never even been approached by any other band. 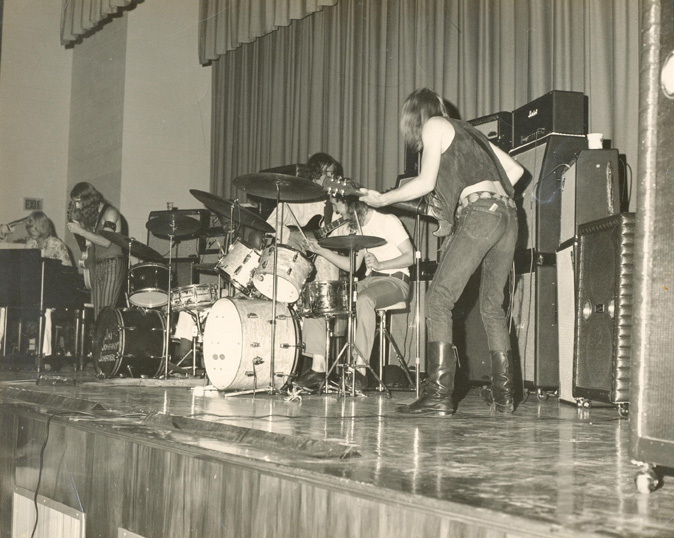 Of course, there were tons of great bands in North Florida at that time. You don't need me to run the list again, but at that time in the world, in my life, the Allman Brothers were " IT". ... THIS Gold Top Les Paul... every time! they'd make them roll Marshall amps and cabinets out into the parking lot to crank 'em up. I'd hear them from my house about 12 blocks away, and head down to observe. that Gold Top through a Marshall. Later on, when he switched to 'Bursts, as I'll soon describe, his sound didn't change that much. when he played slide on the Gold Top, the universe held it's breath to listen ( I did, anyway)! know how he and Clapton created arguably the best two-guitar song of all time, and now we all know how, besides his own amazing hands, he created that sound, the sound that still runs chills up my back EVERY time I hear him call like a seagull at the end of Layla. The sound, quite simply, of Duane Allman's Gold Top. I took the guitar to Duane's cousin, Annie, who touchingly wept openly at the sight of it. I've taken it to Derek Trucks to play. Annie says he weeps every day wishing Duane had stayed off his bike that day... as do we all. earliest PAF's followed him onward. The pickups in the Gold Top now are the PAF's from that plain top, which Duane had one of the roadies, maybe Red Dog, switch out. Remember, though, the most important part of a guitar's tone is two things... the instrument itself and the player... the pickups are less important than the wood, but nobody, Duane included, knew that then.